The scientific and rational land and water resource management is the basic need for providing basic necessities i.e. food and water to the millions of human and livestock population. Increasing biotic pressure and over exploitation of land, deforestation and improper water management lead to increase erosion, development of water logging and conversion of fertile agricultural land to unproductive waste land. Under such conditions, improvement and attainment of sustenance in agricultural production necessitates proper and timely monitoring and judicious utilization of natural resources through adoption of ecologically sustainable management practices. Optimal utilization of the resources calls for cutting across the narrower confines of sectoral approaches, taking holistic view of the region/unit it is observed that watershed as basic unit of development has better control over natural resources. By adopting watershed as a unit, different measures can be adopted and executed carefully in each of the toposequences according to its capability. This approach is thus a vastly improved strategy over the existing broad and basically sectoral programs. Advances in sciences are useless, if there is not sufficient water and enough good land for farming, If the water and soil on which all the agriculture and all human life depend is wasted away. Since water and soil are the basic resources, it necessitates the evaluation of watershed in terms of run-off potential and erosion susceptibility, in order to adopt various soil and water conservation measures and development actions. These processes can be assessed for each single land use and land type, small unit source watershed and large watershed of mix land use. Estimation of run-off and soil loss is possible by the identification of parameters such as land use/ land cover, physiography, geomorphology, soils, hydrology etc. Some of these phenomenon are dynamic in nature. Land use/land cover is the most dynamic phenomenon which changes from one growth stage to another, season to season, year to year and within agro climatic regions. The dynamics of the land use/land cover pattern can be captured from satellite platform because of its synoptic coverage. Another advantage of remote sensing technology is inherent matching of data sets of various themes as they are based on same data source – the satellite imagery. Moreover, remote sensing technology by its repeated survey of the same area enables us to monitor the progress of work. Since geographic data amassed from satellite remote sensing is of huge volumes, there is need for Geographic Information System (GIS) to handle this data. GIS is powerful tool with unique capability for storing, manipulating, retrieving both spatial and non-spatial data. It is useful to perform simple/complex analysis of the spatial as per our need. Modeling of natural phenomenon such as hydrologic response of watershed to precipitation and its phenomenon to erosion hazard due to run-off can be best simulated through GIS. Effective use of space based RS data suitably integrated with collateral, hydrological and meteorological data through the use of GIS solutions with cloud services can help to evolve alternate prescriptions to achieve sustainable development of natural resources. 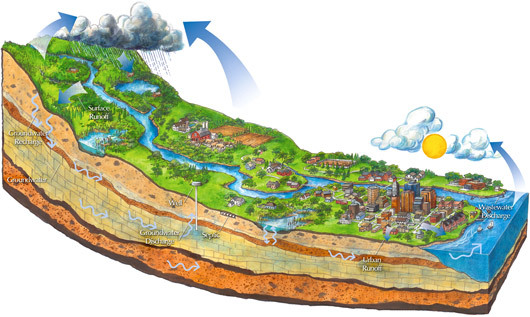 A watershed is a topographically delineated area drained by the stream system, to some point on a stream or river. It is an area from which runoff resulting from precipitation flows past a single point into a stream, river, lake or an ocean. Watershed provides a limited surface area, so physical processes pertinent to morphology and hydrology have crucial impact on it. The climatic parameters such as water storage, sedimentation and evapotranspiration of watershed beneficial in determining denudational rates, moisture and energy balances. These determinations, in turn, help in management of land, water, flora, fauna and the bio-geo-physical environment. Field Work: Field work is necessary for ancillary data collection ex rainfall, soil data collection. Analysis: major part of it data analysis and final output generation by using GIS domain. Universal Soil Loss Equation etc.. The inherent matching of the data sets of various watershed characteristics as they are based on the same satellite imagery has provided most economical inventories. Dynamic phenomenon such as land use change can be best captured using multi-temporal satellite data for arriving at most accurate estimates. Geographic Information System (GIS) is proved to be an useful tool in spatial data base creation, for making data compatible from one format to another and retrieval of data as per requirements. Since input data is geographic in nature, GIS found to be a potential tool while carrying out criteria based spatial analysis towards optimal management of natural resources. It is found that natural phenomenon such as hydrologic response of selected area of watershed to precipitation and its proneness to water erosion can be best simulated through GIS. SCS CN model and SYI model used for the estimation of runoff and soil loss respectively, have several advantages. They require few and easily available parameters, sensitive to changing land use condition/practices and easy to use by employing GIS techniques. Geographic Information System (GIS) is capable handing problems related to watershed through estimating Runoff and Sediment yield. Using GIS, it is possible to handle spatial and non-spatial data and it is important in runoff and sediment yield modeling. Ultimately using GIS analysis we can save time and man power. SYI and soil loss models gives priority areas for soil conservation measures based on all the physical characteristics of the micro-watershed & watershed. This entry was posted in General and tagged Benefits of GIS, cloud, gis, watershed management. Bookmark the permalink.